Kakaban island can easily be reached by boat from Sangalaki in 20 to 30 minutes. The island is quite steep with limestone cliffs covered with dense jungle right down to the water's edge. 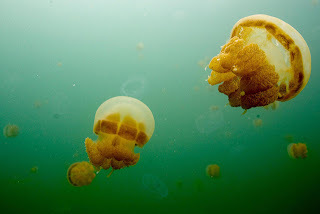 The most unique feature is the huge brackish water lake in the middle which is well worth visiting, because of the millions of non-stinging jelly fish living in the lake. There aren't many beaches around the island since it is surrounded by deep ocean. The wall drops to 180 m and currents can be strong with upwelling, downcurrent and reversing directions.